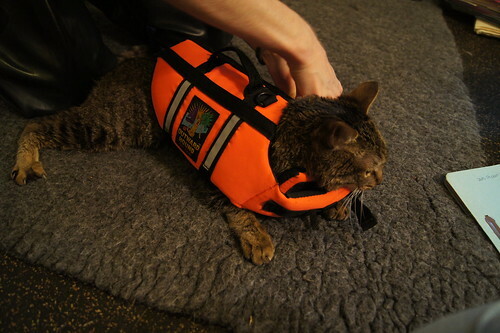 And the buoyancy of the water helps Moki to walk. I'm sorry for the delay in my postings; things have been hectic due to a early season snow storm! 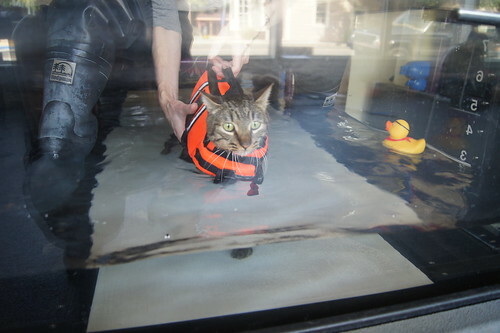 Today's topic is Hydrotherapy for pets. Dogs, cats and horses now benefit from this unique water treatment. Hydrotherapy utilizes the properties of water, like buoyancy, pressure, viscosity and resistance to improve the body's functions. Pools and treadmills are common treatment options for pets. 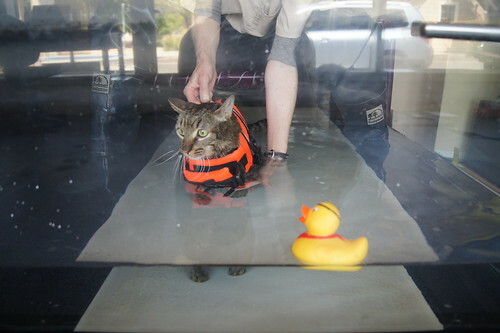 There have been documented cases of hydrotherapy in animals since the 19th century. Conditions treated by hydrotherapy can be divided into four general categories: post-operative, pre-operative, chronic conditions and fitness (for those of us who need to lose a few pounds!!). 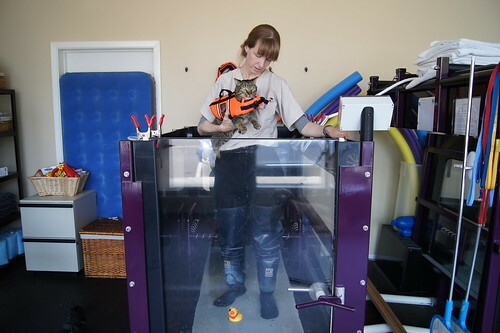 While in the water the pet will feel a lower level of gravity forced on the body. This then produces decreased weight bearing on any problem areas and results in decreased pain perception. This specifically helps animals with weak muscles, stiff/swollen joints or poor range of motion. The buoyancy and warm temperature of the water increase flexibility, improve circulation and ease pain. The combined effect is greater mental security and a willingness to perform exercises. We have a hydrotherapy pool at the shelter and it does help dogs with numerous medical issues to feel overall better, and get their exercise in no matter their medical issue. Just like people, pets need to be treated with those who are skilled in this area. These people are usually called Animal Rehabilitation Therapists, or ARTs. Hydrotherapy is also most successful with a series of sessions to help the body become used to the new form of exercise. A great end result is the building of muscle mass for the pet, which can help to strengthen the overall body. With any medical treatment, please consult your vet before taking action. This alternative treatment may be the perfect fit for both you and your pet! In today's world, our cats, dogs and equines are suffering from the same chronic issues that affect humans. Some of these issues include diabetes, musculoskeletal problems like arthritis, asthma, chronic pain, reproductive problems, paralysis, gastrointestinal problems and neurological disorders. There are many causes to these issues; the major impact appears to be the poor quality of foods sold for pets. Just as for humans, a poor diet can lead to weight gain and obesity, which can have all of the above side affects. Many vets are turning to a holistic approach to health problems; acupuncture has become a popular treatment. Acupuncture has its origins in traditional Chinese medicine; it's core belief is that disease is caused by an imbalance in the body; acupuncture will balance the energy and help the body heal itself. Acupuncture uses thin needles that are inserted into certain acupuncture points in order to stimulate the the flow of qi which is life force energy. The length of a treatment for a pet depends on the medical condition; some pets may need several treatments over time. Details can be found at the International Veterinary Acupuncture Society at www.ivas.org. While considering such treatment, diet and exercise will also benefit the pet and owner. I have personally seen success with these treatment at my shelter with Danny the Dog; he is semi paralyzed from being hit by car. His repeated weekly treatments have given him the ability to stand, take steps and move on his side without severe distress. 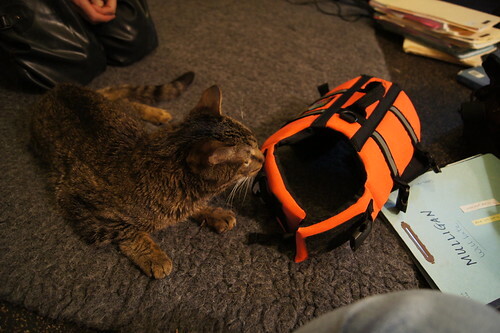 Moki Fogg also posts his own sessions with acupuncture and does quite well. Please consider a holistic option to help your pet live their life to the very best quality possible! Wheelchairs Are Not Just for People! We all know of someone who needs the use of a wheelchair in life, be it only temporary or at on a daily use basis. Well, pets can and do use wheelchairs too!! Some pets are born with disabilities which do not allow the full use of their legs, while others lose the use of their legs due to illness, age, an accident, or sadly, abuse. A quick search on Google shows various shapes, sizes and styles of wheelchairs for pets. Most pets do adapt to using their chair after patience and training. Pets that have limited use of the rear legs benefit by using the wheelchair, as they enable the pet to exercise for a longer duration of time and achieve a more intense exercise. Pets learn to both urinate and defecate while using their wheelchair. For those pets that are weak in the front legs, or need extra support, a saddle sling is an excellent option. When using any of these items, it is best to check the fit for comfort of the pet; friction sores can appear from skin rubbing on the straps, just like on human skin. Simple padding will prevent these sores. A wheelchair is an investment for a disabled pet, and help is available. There are sites that offer financial aid to owners of disabled pets; some vendors may even offer a discount on their unique design for your pet. Never give up hope for your pet; modern medical science, both human and animal, have made dramatic changes to better lives. Take advantage of these amazing items and help your disabled pet lead a fully and happy life!